Once Upon a Time… online by David Bedford and Rosie Reeve is a book for younger children that is useful for starting conversations about online safety, focusing on asking for permission before going online. Online safety is a conversation that parents must have with children from a young age. Ideally, the sooner you start having these conversations the better. As you can start to shape your child into being a responsible user, before letting them loose in the online world. This book has one message – children must ask for permission before going online. It tells the story of some fairytale children (Cinderella, Little Red Riding Hood, 3 pigs, Bad Wolf, Jack from the Beanstalk and Rapunzel) who find a lap top and start to do what kids like to do – play games, watch videos on how to style hair, online shopping, apps to make life easier etc. Eventually the glamour of being online wears off and the reality arrives ie paying the bill no one to play with , bored when device breaks etc. The Fairy Godmother flies in, tells them they must ask a grown-up before going online, and shows them some better ways to go online ie share devices, make a movie together. This is one of the many books that are available on online safety. It covers one small part of the conversation and does not cover everything. So you would still need some other books to read as well, as it alone will not keep your child safe online. 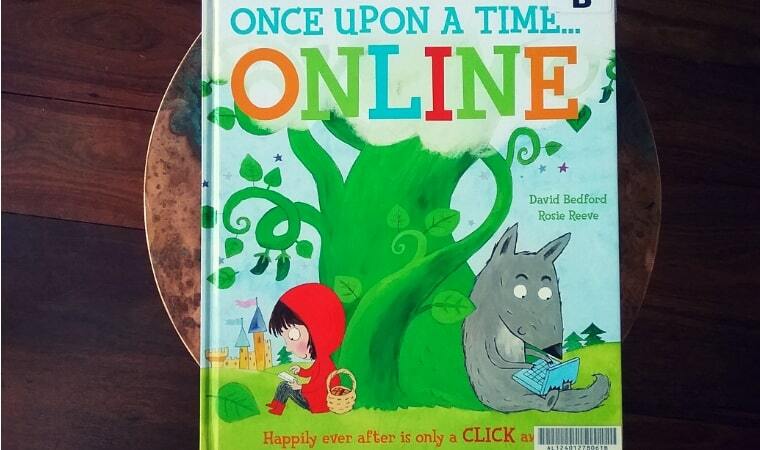 Once Upon a Time… online by David Bedford is ideal for children between the ages of 4 – 8 years of age. Buy a copy of Once Upon a Time… online by David Bedford from Amazon or Book Depository or Booktopia.